Alternative Eden Exotic Garden: Win £500 to spend on a LazyLawn installation! Win £500 to spend on a LazyLawn installation! To celebrate the successful opening of the new LazyLawn show gardens in Chiswick, we’re offering one lucky reader the chance to win £500 to put towards their own professional LazyLawn installation. 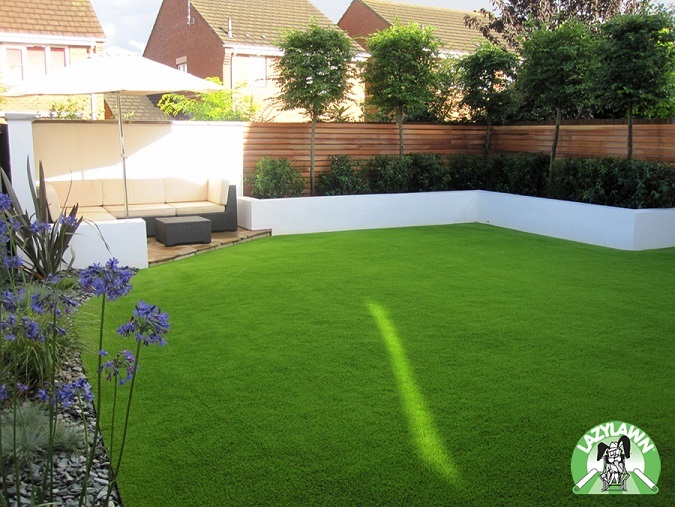 The new show gardens, which are located on Sutton Lane North, feature a range of contemporary LazyLawn that has been installed to inspire homeowners in to transforming their existing gardens in to a LazyLawn that will be loved by all the family. The new show gardens are open Monday to Friday, 9am to 5pm and on Saturday, 9am to 1pm. If you can’t make it to the show gardens, you can view LazyLawn’s impressive product range on their website. Remember to make sure we are able to contact you if you do win. Terms and conditions: This competition closes at 23.59 on Saturday 31st August 2013. Any entries received after this time will not be counted. Entrants must be UK residents aged 18 years or older to enter. By entering this competition you agree and consent to your name being published and by taking part in the competition, entrants are deemed to have read, understood and accepted all of the Terms and Conditions and agreed to be bound by them. The winner will be selected at random from all entries and will be announced here on the blog. Please make sure we are able to contact you if you do win, as we will need to provide your contact details to LazyLawn to arrange your prize. Too bad, can't enter as I live in the US. Hey, when you guys are coming to the US to visit NYBG? If you come by September 8, that medicinal show will still be going. I think you will like visiting the Enid A. Haupt Conervatory as it is the place with exotic plants which you guys will like. If we have some time, then we can try to meet somewhere in NYC for some tea/coffee. Will let you know KL, so looking forward to it :) Itinerary is quite packed but hoping will have time to meet up! Would do this if I knew how to twitter lol!! !